The Hotel Boccaccio , 3-star hotel in Milano Marittima near the center, has parking, free WI-FI internet and free bicycles. It admits pets of all sizes. 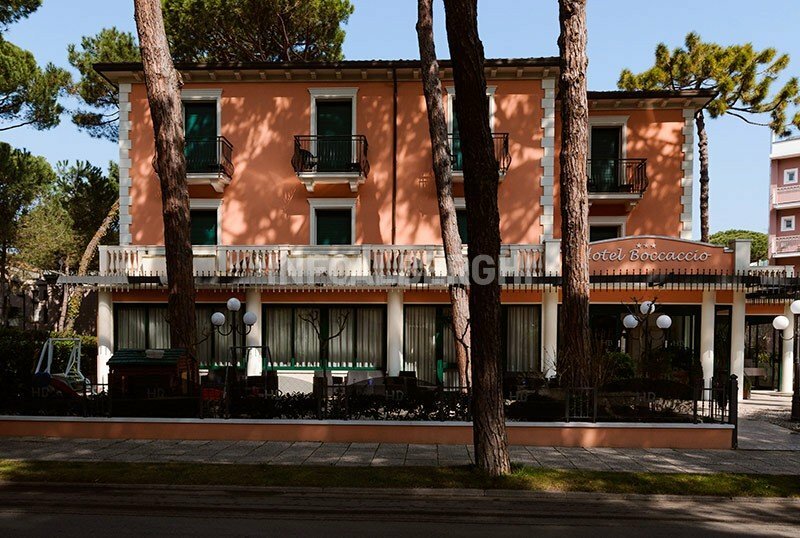 The hotel is located in Milano Marittima in a quiet and shady area near the center, about 5 minutes walk from the beach. Nearby: the natural park of Cervia, Cerviavventura, the spa. The Cervia and Mirabilandia Saltwater Visiting Center is easily reachable by car. The rooms are equipped with balcony, air conditioning, TV with satellite channels, WI-FI, safe, telephone and bathroom with shower, hairdryer and courtesy set. Garden, free bicycles, lift, reading room. AIR CONDITIONING : available both in the common areas and in the rooms. PETS : animals of all sizes allowed free of charge. LUNCH AND DINNER : 3-choice menu, homemade pasta and desserts, water with meals always included. CHANGES: the menu is suitable for vegetarians. In the hotel: outdoor playground area, entertainment. At meals : baby food , high chairs at the table, bottle warmer. The hotel has an agreement with Bagno Umberto and Bagno Giorgio Malusi. Il Bagno Umberto has a baby park, sports fields and a relaxation area. Il Bagno Giorgio Malusi offers many services including: hot showers, bar and restaurant, entertainment and spaces for children.